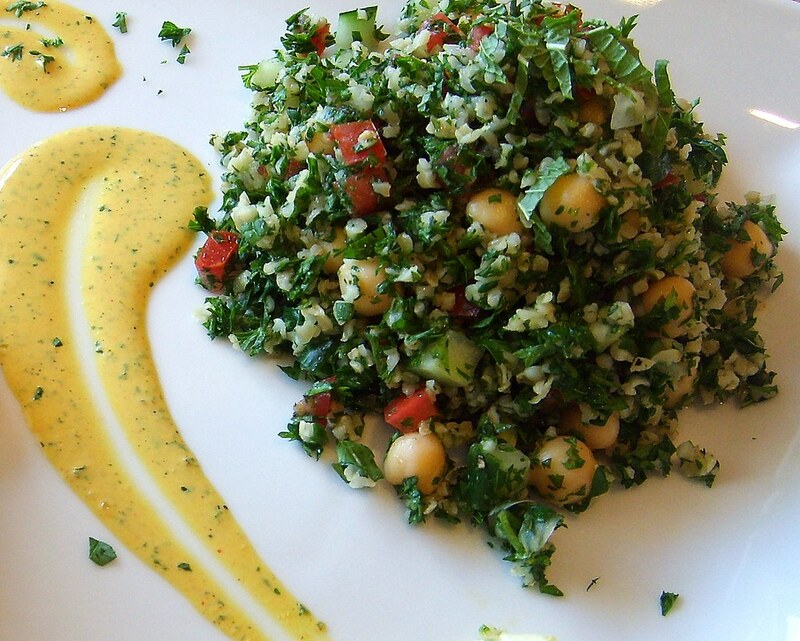 Tabbouleh salad is one of my favorite salads and is incredibly healthy too! Because the salad contains large amounts of parsley it is loaded with anti-oxidants, vitamins and minerals. And with the addition of chickpeas it is a good source of protein and fiber. I eat Tabbouleh salad just about every day for lunch...whether I make it myself or purchase it from Whole Foods Market, I just can't get enough of it! I like to serve it as a side dish with falafels, hummus and whole wheat pita bread or lavash. Bring a cup of water to boil, place the bulgur in a bowl and cover with water. The water should cover the bulgur 1/8 - 1/4 inch. Cover bowl with a plate and let rest for 30-40 minutes. Fluff with a fork. If there is any water remaining after sitting, drain the bulgur really well and then pat dry on a paper towel. Mix all dry ingredients in a bowl and season with salt and pepper. Add lemon juice, red wine vinegar and olive oil. Let Tabbouleh sit in the refrigerator for about an hour for the flavors to develop. Taste and adjust seasons if necessary. In a food processor or blender, mix all ingredients until smooth and creamy. Should have a consistency of heavy cream.